says "Kesari is an Indian period war drama film. It stars Akshay Kumar, Bhagyashree and Parineeti Chopra in the lead roles and directed by Anurag Singh"
to get instant updates about 'Kesari' on your MyPage. Meet other similar minded people. Its Free! 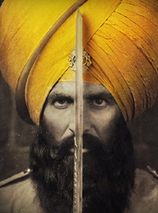 kesari says "Kesari is an Indian period war drama film. It stars Akshay Kumar, Bhagyashree and Parineeti Chopra in the lead roles and directed by Anurag Singh"
kesari says "Kesari is a Hindi movie starring Akshay Kumar playing the lead role"